HOME’s always been a place with a bit of a buzz about it, and now even more so than ever! This summer we welcomed the arrival of two honeybee colonies! We’ve installed the hives on the flat roof of our building, surrounding them with planting to provide pollen and nectar for the bees right on their doorstep. ‘Why bees?’ you ask. Well, since way back in 2014 when we were first planning the move to our purpose-built venue on First Street, we’ve been committed to supporting biodiversity in Manchester city centre. We looked upwards and found that the roof was the perfect place to plant our ideas and let them grow! We set our sights on bees – the hardworking, beloved emblem of Manchester – and wanted to establish a home for supporting at-risk pollinator species. Thanks to a fantastic fundraising effort by all of our team, we were able to put our plan into action, gathering all of the materials and equipment for beekeeping and training staff as apiarists at Manchester District Beekeeper Association in Heaton Park. With wildflower seed kits from Grow Wild and donations from the green-fingered members of the team, we set to work creating forage for our new arrivals. Always striving to make sustainable choices, we’ve re-purposed old theatre lights, stage props and exhibition materials, turning them into planters – we’ve even got old washing machine drums brimming with lavender! Our bees get the best choice in Manchester too – they’ll happily fly up to two miles to seek out the flowers with the tastiest nectar that they’ll bring back to the hive to be turned into honey – wildflower meadows and hedgerows, lush canal towpaths and railway line cuttings, backyards and gardens brimming with colour are all foraging hot-spots for these busy pollinators! Our four staff beekeepers inspect the hives weekly during the warmer months, and regularly attend further training sessions to learn how to care for the honeybees from season to season – these mythical creatures keep us on our toes! 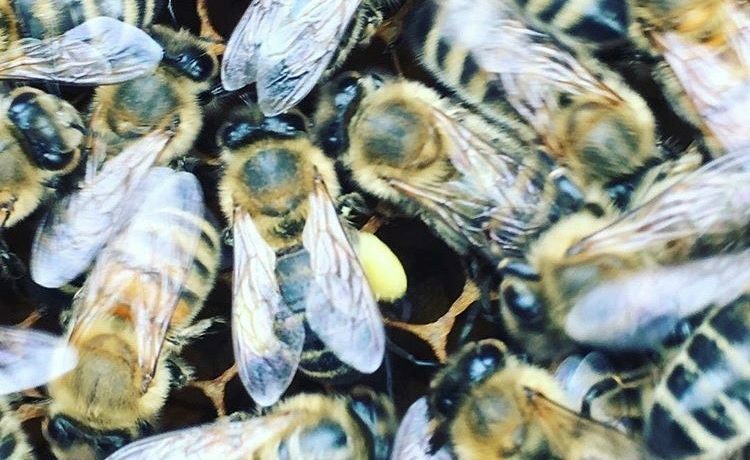 We look forward to sharing our beekeeping journey with you through our social media channels – whether it’s waggle-dancing on Instagram or spotting the Queen bee laying eggs on Facebook, we want to show you a bee’s eye view of HOME. Want to know more? Check out our interview with Manchester Climate Change Agency.